An interstate cooperative that strives to increase high school graduation rates, broaden access to education beyond high school, and boost postsecondary degree completion — particularly for those who would be the first in their families to enroll. Go Alliance research and services focus on college access policy as well as campaigns and programs to motivate and help students prepare for postsecondary education. SREB staff provide state agency officials expertise in education policy, program design and college access marketing. Go Alliance can deliver state-specific research and recommendations to policymakers to identify areas of overlap, contradiction, gaps, loopholes or barriers to college access. For example, in 2010, as part of a National Governors Association grant, West Virginia contracted with Go Alliance for a comprehensive, statewide audit of policies and programs that affect high school graduation rates. The results were used in state legislation to reduce dropout rates. Go Alliance members participate in collaborative programs that allow states to accomplish together what they might not be able to do individually. Go Alliance staff facilitate resource-sharing between member states, which can result in significant financial savings. For example, 16 states use SREB’s Go Alliance Academy, which trains counselors, teachers and mentors to advise students who would be the first in their families to go to college and to create a college-going, career-planning culture in their schools. Go Alliance provides professional development for college access program staff at its annual meeting and in a workshop series with national experts in access, social marketing and communications. Meetings often feature hands-on learning on topics requested by members. Go Alliance helps states replicate programs that have proven effective in other states. It connects college access professionals from state to state to share best practices and discuss issues relevant to their work. For example, Go Alliance helped states throughout the SREB region replicate North Carolina’s successful College Application Week program for one-on-one assistance to students completing applications to postsecondary education. Go Alliance is a consortium of states that work together to increase the number of students who successfully complete an education program beyond high school. Go Alliance focuses on: 1) improving college access policy; 2) increasing both the quality and availability of support programs that help students prepare for and apply to postsecondary education; and 3) enhancing communications strategies that inform students about how to plan and apply for college and motivate them to do so. Go Alliance members participate in collaborative, multi-state programs that use best practices and diffuse costs, allowing states to accomplish together what they might not be able to do individually. Go Alliance helps states replicate successful programs that have proven effective in other states. It also connects college access professionals from state to state so they can share best practices and discuss issues relevant to their work. How is Go Alliance funded? Go Alliance is a membership-based organization that is funded through annual membership fees. Go Alliance has also received sponsorship funding from ACT Inc. and the College Board, as well as grants from Lumina Foundation, the Bill & Melinda Gates Foundation and the National Governors Association. How can my state or organization become a member? The unit of membership for Go Alliance is a state. Membership is open to both SREB and non-SREB states. Once a state is a member of Go Alliance, services are made available to all staff of nonprofits organizations and agencies that work in the area of postsecondary access and success. Resources are made available to states through their Go Alliance representatives and can be used for not-for-profit educational purposes only. For SREB states, the annual cost of Go Alliance membership is $8,000 per state. For non-SREB states that participate in Go Alliance’s College and Career Counseling Initiative, annual membership is $10,000 per state. For non-SREB states that do not participate in SREB’s counselor training program, Go Alliance annual membership is $12,000 per state. Here’s one way your state could do more to help more students go further in their education after high school. This brochure outlines the benefits of Go Alliance membership. Think of it as intensifying and optimizing your state’s efforts to help more high school students continue their learning. A how-to guide for state leaders who want to establish a College Application Week in public high schools. 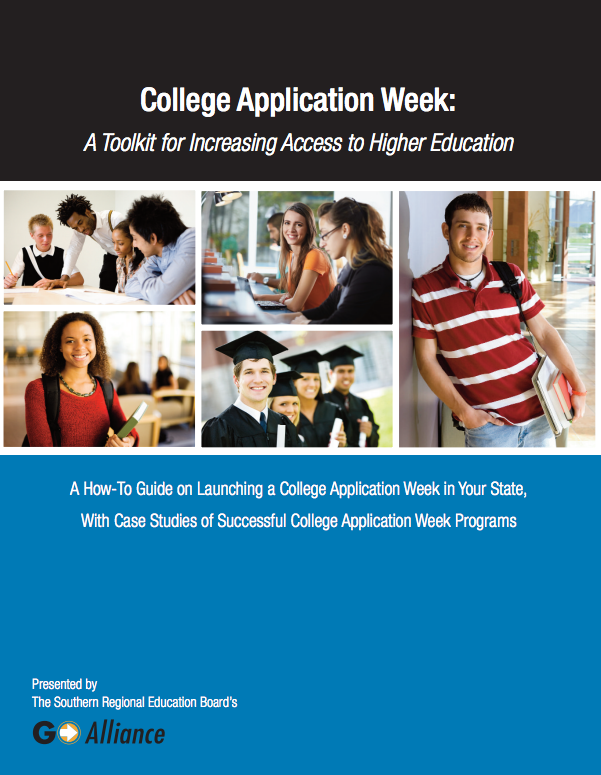 The toolkit includes best practices, tips and strategies, and case studies of College Application Week programs under way in SREB states. College Application Week programs are campaigns to help high school students — particularly those who would be the first in their families to go to college or those not planning to attend college — apply to at least one postsecondary institution during their senior year.